Google Business View, based on Google Street View Trusted Photography, is one of the best ways to elevate the profile of your business and maximise its appeal to new customers. With 95% of all internet searches passing through Google, the more you can do to optimise your Google listings the better. By combining 360 Spin’s professional photography with Google’s cutting-edge technology, we can give you the visual impact you need to compete for valuable online traffic. 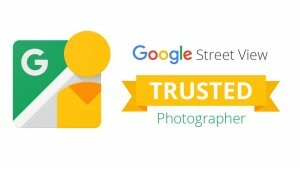 Since May 2012, Google have been adapting their famous Street View Trusted Photography for the use of businesses looking to showcase their premises to prospective customers. Working through a small network of Google Trusted Photographers and Agencies, the search giant enable businesses to display an interactive, 360 degree panoramic tour of their stores, eateries, factories and other buildings. 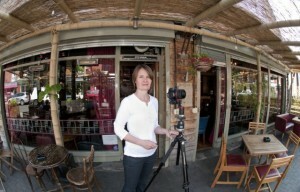 Nicola Williams of 360 Spin was one of the first Google Trusted Photographers in the Manchester area, and she is still one of only a small number listed. 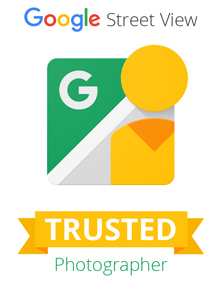 Note: Only Google Trusted Photographers are permitted to upload virtual tours to Google Business View. Let 360 Spin Put Your Business Back on the Map? Customers are increasingly expecting plenty of engaging, interactive content (videos images, etc.) when they research a company or organisation. If not, chances are your competitors are pushing your company profile and website down and out of sight in the search engine rankings, particularly on smaller screens such as those found on smartphones. 360 Spin offers you a simple, cost-effective remedy: book a photo-shoot with Nicola and we will soon have your high quality images and tours ready for upload. Google Business View is identical to the Street View Trusted Photography you will be familiar with from Google Maps and Google Earth, down to the handy navigation links. Once 360 Spin has carried out your photography, we will upload it straight to Google, where it will soon be featuring on various Google platforms, from Google Search and Google Maps to Google My Business and Google + Local. In most cases, this one small step will be enough to boost your business to the top of the page – especially for local searches. Nicola is in very high demand, so please book soon to be sure of getting your Google Business View tour online as quickly as possible. Every day lost is a day where your competitors could be stealing your customers right from under your nose. The photo-shoot itself can be carried out quickly and timed for your convenience. Nicola can also consult with you to advise the best time to take photographs depending on your specific business. There is usually no need to close your business and you can rest assured that the session will be carried out discreetly and professionally with a minimum of fuss. To book your photo-shoot or to find out more about Google Business View and Street View Trusted Photography, please get in touch with us today.